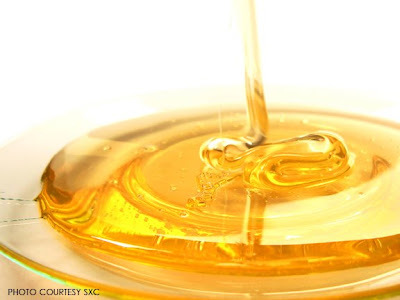 Honey is an indispensible ingredient when it comes to beauty treatments. Its anti-oxidant, anti-microbial and hydrating properties make it integral to regular beauty routines. Sugars, waxes and traces of minerals are found in honey. It is an anti-irritant that is suitable for every skin types, including sensitive skin. It is excellent to keep your skin soft, supple and smooth. Honey in its purest form, can be used as a natural moisturizer and cleanser. It is a vital constituent while making natural body scrubs, face packs and beauty masks. It is wonderful for keeping your hair shiny and functions as a natural hair conditioner. • Mix half a cup of honey in your bath; this will keep your skin soft and healthy. • Take a bit of milk powder on your palm and mix it with one spoon of honey. Apply it on your face and rinse off with warm water. This can be used as a facial cleanser on a daily basis to get rid of make up and dirt. • Apply a concoction of honey and lemon juice in equal quantities on your face and neck. Let it stay for twenty minutes and then, rinse it off with warm water. It rejuvenates your skin. • To get smooth complexion and flawless skin, mix a cup of honey with three spoons of rose water. Massage your skin with this mixture. • Mix one cup of honey with one cup of coarse sea salt. Add olive oil or almond oil (1/4 of a cup). Use this mixture to scrub your face and body to reveal glowing skin. Use circular motions at the time of scrubbing and rinse thoroughly. • Mixing chopped almonds with a spoon of honey and using it as a scrub can work wonders to your skin. Be gentle to your skin while rubbing and then, rinse off, preferably with warm water. • If you want to treat acnes and fine lines with simple home made remedies, take a spoon of almond oil and mix it with two spoons of honey. Massage your skin gently with this combination for three to five minutes. Leave it on your skin for twenty minutes. Rinse it off with warm water first and then, with cold water. • Prepare a rich and soothing skin lotion by mixing a spoon of honey with a spoon of cooking oil and a bit of lemon juice (1/4 part of a spoon). Apply on your hands, elbows and heels with a cotton swab. Leave for fifteen minutes and rinse with warm water. • Whip egg white with a spoon of honey. Add flour to make a paste. Mix thoroughly and apply it on your face. This firming mask should be left on your skin for around ten minutes and then rinsed off with lukewarm water. • Add one spoon of honey to four cups of lukewarm water. Mix thoroughly and use it as a hair rinse after you shampoo your hair to keep your hair soft and shiny. • Honey is laden with moisture and thus, it can be used as a conditioner to deep condition your hair. Add a quarter cup of honey to two spoons of olive oil or almond oil and two spoons of pure aloe vera gel. Apply it on damp hair, keep for half and hour and rinse. • Honey is very effective when applied on dry hair. Try massaging your scalp and ends of hair with honey mixed with warm olive oil. Wrap your hair with foil paper and leave for about twenty minutes. Rinse. Thus, honey is an exquisite gift of nature and it can be a perfect treat to your hair and skin. The ultimate all round beauty potion that it is, the incorporation of honey in regular skin care and hair care regimen is not at all a new concept as you might think it to be; it can be traced back to ancient history. Did you know that the Egyptian queen Cleopatra, a “woman of surpassing beauty” and “irresistible charm” bathed in milk and honey to sustain her magnificence? Louis XV’s last mistress, Madame du Barry, was known to apply honey on her face to preserve her youthful look. Queen Anne of England used a blend of honey and oil to care for her thick long hair, gorgeous and lustrous. You too can indulge in the goodness of honey to rediscover your beauty in the natural way. I myself use honey everyday with lemon as a face wash …. n its effect, I can see myself. Tapaswini..I agree 🙂 honey has a lot of benefits really!! i will try the honey with rose water tonight :)..also, is it good for all skin types? and i see that honey needs to be mixed with something in order for it to be effective. i suppose direct use of honey might not be as effective..
**I was lucky dat we had a beehive in our house (tree in our garden) and we got a big jar of honey from it with the help of the beekeeper :yahoo: :yahoo: i use that honey! Lucky you Somreeta :)) & i will surely check out if there is any Additives in Dabur’s List. :suspense: :suspense: . Can I use honey in my henna,that is when applying my hair. :thanks: 4 the useful info Somreeta! Today I am searching home remedies and uses of such natural ingredients..n this is the 2nd article I found written by you 🙂 M curious from whr do u collect such info..?